If the world of business doesn’t have enough crazes and fads to keep consultants and gurus peddling their seminars, books, and services, they’ll surely come up with one. There is some of this hype surrounding the geekishly named “blockchain” technology, which began with a so-called Satoshi Nakamoto (the pseudonym for the unidentified creator of bitcoin) as a “purely peer-to-peer version of electronic cash”, as he described it in 2008. To work as cash, bitcoin had to be able to change hands without being diverted into the wrong account and to be incapable of being spent twice by the same person. To fulfil Mr Nakamoto’s dream of a decentralised system the avoidance of such abuses had to be achieved without recourse to any trusted third-party, such as the banks which stand behind conventional payment systems. It is the blockchain that replaces this trusted third-party. A database that contains the payment history of every bitcoin in circulation, the blockchain provides proof of who owns what at any given juncture. This distributed ledger is replicated on thousands of computers—bitcoin’s “nodes”—around the world and is publicly available. But for all its openness it is also trustworthy and secure. This is guaranteed by the mixture of mathematical subtlety and computational brute force built into its “consensus mechanism”—the process by which the nodes agree on how to update the blockchain in the light of bitcoin transfers from one person to another. Let us say that Alice wants to pay Bob for services rendered. Both have bitcoin “wallets”—software which accesses the blockchain rather as a browser accesses the web, but does not identify the user to the system. The transaction starts with Alice’s wallet proposing that the blockchain be changed so as to show Alice’s wallet a little emptier and Bob’s a little fuller. The network goes through a number of steps to confirm this change. As the proposal propagates over the network the various nodes check, by inspecting the ledger, whether Alice actually has the bitcoin she now wants to spend. If everything looks kosher, specialised nodes called miners will bundle Alice’s proposal with other similarly reputable transactions to create a new block for the blockchain. This entails repeatedly feeding the data through a cryptographic “hash” function which boils the block down into a string of digits of a given length (see diagram). Like a lot of cryptography, this hashing is a one-way street. It is easy to go from the data to their hash; impossible to go from the hash back to the data. But though the hash does not contain the data, it is still unique to them. Change what goes into the block in any way—alter a transaction by a single digit—and the hash would be different. That hash is put, along with some other data, into the header of the proposed block. This header then becomes the basis for an exacting mathematical puzzle which involves using the hash function yet again. This puzzle can only be solved by trial and error. Across the network, miners grind through trillions and trillions of possibilities looking for the answer. When a miner finally comes up with a solution other nodes quickly check it (that’s the one-way street again: solving is hard but checking is easy), and each node that confirms the solution updates the blockchain accordingly. 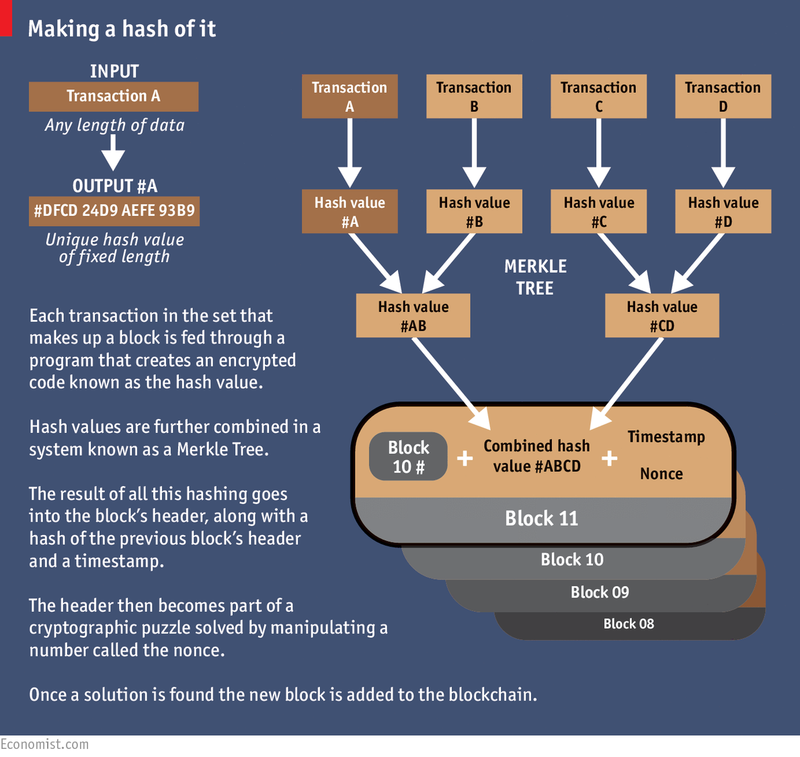 The hash of the header becomes the new block’s identifying string, and that block is now part of the ledger. Alice’s payment to Bob, and all the other transactions the block contains, are confirmed. This puzzle stage introduces three things that add hugely to bitcoin’s security. One is chance. You cannot predict which miner will solve a puzzle, and so you cannot predict who will get to update the blockchain at any given time, except in so far as it has to be one of the hard-working miners, not some random interloper. This makes cheating hard. The second addition is history. Each new header contains a hash of the previous block’s header, which in turn contains a hash of the header before that, and so on and so on all the way back to the beginning. It is this concatenation that makes the blocks into a chain. Starting from all the data in the ledger it is trivial to reproduce the header for the latest block. Make a change anywhere, though—even back in one of the earliest blocks—and that changed block’s header will come out different. This means that so will the next block’s, and all the subsequent ones. The ledger will no longer match the latest block’s identifier, and will be rejected. Is there a way round this? Imagine that Alice changes her mind about paying Bob and tries to rewrite history so that her bitcoin stays in her wallet. If she were a competent miner she could solve the requisite puzzle and produce a new version of the blockchain. But in the time it took her to do so, the rest of the network would have lengthened the original blockchain. And nodes always work on the longest version of the blockchain there is. This rule stops the occasions when two miners find the solution almost simultaneously from causing anything more than a temporary fork in the chain. It also stops cheating. To force the system to accept her new version Alice would need to lengthen it faster than the rest of the system was lengthening the original. Short of controlling more than half the computers—known in the jargon as a “51% attack”—that should not be possible. Leaving aside the difficulties of trying to subvert the network, there is a deeper question: why bother to be part of it at all? Because the third thing the puzzle-solving step adds is an incentive. Forging a new block creates new bitcoin. The winning miner earns 25 bitcoin, worth about $7,500 at current prices. Once you strip away the hype and the high-profile crimes and accidents associated with cryptocurrencies, distributed ledgers are nothing more than a clever new form of database technology. They are born of advances in the internet, open-source protocols, computing power and the science of cryptography. They are shared, replicated, decentralised transactional databases. A transaction committed to the database is added to all those that came before it, and it persists for life as part of the immutable ledger. No one has the unilateral power to edit or revise the ledger’s history and no single entity acts as the administrator. These ledgers are continuously replicated and synchronised. Resilience is enhanced by elimination of central points of failure: if one location suffers an attack or breakdown, others are able to maintain the integrity of the ledger. Security and privacy are achieved by sophisticated credential-checking techniques, and data are protected through encryption. The simple consequence of all this is that distributed ledgers create the opportunity for independent entities to rely on the same, shared, secure source of information. Entities with a need to know about a financial transaction include not just the buyer and seller and their brokers, but custodians, registrars, settlement and clearing agencies, central depositories and, importantly, regulators. Costs are cut dramatically, because instead of every interested party keeping their own record, one prime record can do the job. This reduces duplicative record-keeping, eliminates the need for reconciliation, minimises error rates and facilitates faster settlement. In turn, faster settlement means less risk in the financial system and lower capital requirements. By contrast, legacy financial infrastructure is based on centralised, unencrypted hub-and-spoke database architecture. It is expensive, inefficient and vulnerable to both operational failure and cyber-attack. Differences within and across separate databases create inconsistent transaction data that require costly reconciliation. So financial institutions spend a lot of their operational outlays on the generation, communication and reconciliation of vast quantities of data. All this creates opacity and delay, and makes it harder for regulators to keep abreast of what’s going on. Why, though, should clever database design suddenly catch on? After all, traditional financial infrastructure has not been modernised in decades. The answer lies in a ratio. The average return on equity for major banks around the world was 10.8% in 2014. This was down from 11.1% in 2013 and 15.8% in 2004, according to data from Autonomous Research. As a result, banks’ rates of return are unsustainably near or below their cost of capital. This reflects a challenging revenue environment, rising costs and reduced leverage(a good thing) as a result of post-crisis reforms. It means that it has become imperative for banks to find ways to restructure their cost base radically, and to reduce their need for capital, while simultaneously responding to the new regulatory requirements for greater transparency. This is why distributed-ledger technology is attracting so much attention. It is a technology that has the potential to address pressing commercial realities. Rather than being a technology looking for a problem, it is one that can solve real problems. In other words, a technology whose time has come. In 2016 we will see the first, limited applications of distributed-ledger technology to wholesale financial markets, based on private permissioned blockchains. And over the subsequent five to ten years we will see these evolve, improve, standardise and proliferate, until eventually they become the new norm. As Process Excellence professionals we understand that there is often a period of significant adjustment for businesses to figure-out how to best use new technologies in their processes. For example, the thinking of centralized processing of transactions is so ingrained that it may take awhile for people to adjust to the idea that it is better, and safer, to decentralize. Distributed ledgers that settle transactions in minutes or seconds could go a long way to solving such problems and fulfilling the greater promise of digitised banking. They could also save banks a lot of money: according to Santander, a bank, by 2022 such ledgers could cut the industry’s bills by up to $20 billion a year. Vendors still need to prove that they could deal with the far-higher-than-bitcoin transaction rates that would be involved; but big banks are already pushing for standards to shape the emerging technology. One of them, UBS, has proposed the creation of a standard “settlement coin”. The first order of business for R3 CEV, a blockchain startup in which UBS has invested alongside Goldman Sachs, JPMorgan and 22 other banks, is to develop a standardised architecture for private ledgers. It is the sort of thing that happens every day in places where land registries are badly kept, mismanaged and/or corrupt—which is to say across much of the world. This lack of secure property rights is an endemic source of insecurity and injustice. It also makes it harder to use a house or a piece of land as collateral, stymying investment and job creation.